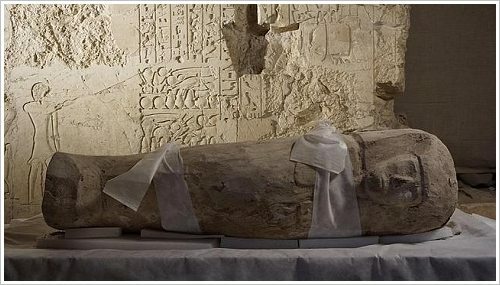 Only yesterday the Egyptian Ministery of Antiquities announced that the Spanish mission working under the Djehuti Project at Dra Abu el-Naga found already by the end of 2012 a wooden model coffin of an about 5-year-old child in a chapel at the south-west of Djehuty's open courtyard. The undecorated sarcophagus measures 20 x 28 x 90 cm and dates back to the 17th dynasty. 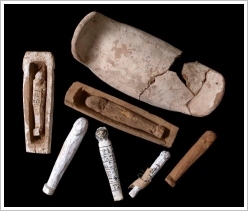 Next to it the archaeologists unearthed pottery als well as six wooden stick ushabtis from the early 18th Dynasty. Two of them bear the name of Ahmose-sa-ya-ir, a well-known priest, written in hieratic. The owner of a third one with cursive hieroglyphs is called Ahmose. Djehuti was Overseer of Treasury and of Works, during the 18th Dynasty reign of Hatshepsut amd later of Thutmosis III. His tomb was discovered in 2003. Since then several important finds dating back to different dynasties have been unearthed (see our news from 22/06/11 and 09/08/12). 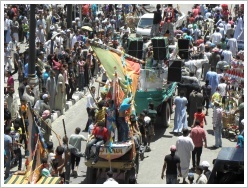 On January 22, 2013 450 chefs from 45 hotels across Egypt met in Hurghada to create the largest ever Om Ali dessert in order to make an entry in the Guinness Book of Records and to put Egypt in the spotlight of the global public with a positive headline. For the dessert, which had in the end a weight of 7 tons and filled a 15 metres long and two metres wide pan, they used 6,000 litres of milk, 800 kg of filo pastry, 100 litres of cream, 1,200 kg of sugar, 50 kg of coconut, 150 kg of mixed nuts and 50 kg of raisins 20,000 LE worth. The cooking needed 5 hours and mainly served for a good cause: The finished product was distributed to charities, tourists and passersby. The event was organised by ECA (Egyptian Chefs Association), which was founded by a Swiss chef in 1997, and supported by FJP and the Egyptian Ministry of Tourism. 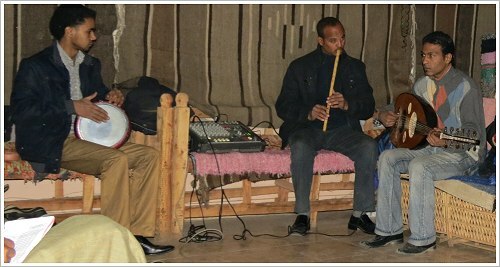 The ECA had already held a competition in Luxor last September. After the markedly well-attended first lecture of the Mummification Museum winter series - one could see that it was long awaited - Susanne Onstine's lecture on next Sunday, February 3, 2013 is about TT16, the tomb of Panehsy at Dra Abu el Naga. 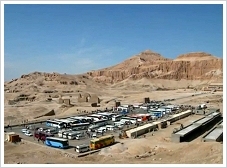 The tomb dates back to the reign of Ramses II (19th Dynasty). Suzanne Onstine is the director of the University of Memphis mission working there. Starting time: 7 pm. 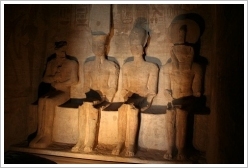 The popular egyptological winter lectures will start next Sunday, January 27, 2013 at 7 pm! Violeta Pereyra, egyptologist of CONICET (Consejo Nacional de Investigaciones Científicas y Tecnícas), Professor of Ancient Oriental Studies at the University in Buenos Aires and director of the conservation project PROCON TT49 will break the first ground. 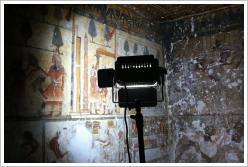 She will talk about the conservation techniques used in the tomb of Neferhotep (TT49). Neferhotep was First scribe of Amun during the reign of Ay. His richly decorated tomb in el-Khokha is one of the largest private tombs of the Theban necropolis and has an interesting depiction of the Karnak Temple. 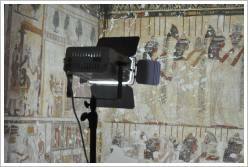 Tthe second edition of the Luxor African Film Festival will take place from 15 - 24 March 2013. This year's motto is "The Magic of African Cinema". More than 70 films and short films from 34 nations will be screened. All were produced in Africa during the last year. Egypt is represented with one film ("Out til Sunlight") and 4 short films. There will be several competitions with price money between 10,000 $ and 1,000 $, one of them with the subject "Revolutions and Films of Freedom". The film "A Screaming Man" by Mahamat-Saleh Haroun from Chad will be featured out of competition at the beginning of the festival. It won the Jury Prize in the 2010 Cannes Film Festival. 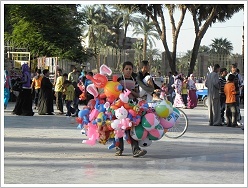 Furthermore, on 3 Febnuary 2013, the award winners from 2012 will be screened again at Bibliotheca Alexandrina. The matter by itsself would be nothing to get excited about because the Mut Temple in the south of Karnak Temple is rich in Sekhmet statues. But while these are seated figures, for the first time a standing statue of the lion goddess was found. 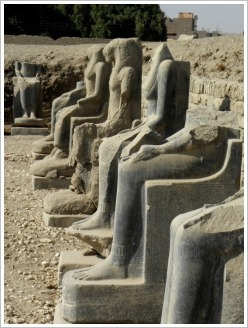 The granite statue is 180 cm tall and dates back to the reign of Amenhotep III. She wears a sun disc on her head. In her right hand she holds an uraeus with an ankh symbol, in her left hand a lotus flower. 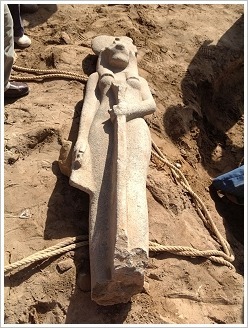 As the Egyptian Ministry of Antiquities announced, the archaeologists of the ARCE (American Research Center in Egypt), which is working at the temple area since May 2012, discovered the statue when they laid floor tiles in the second court of the temple. The temple is closed since 1976 and shall be re-opned im March of this year. The musicians of the Hamada Trio have already enchanted us last winter. Now, they will unbox their instruments oud (lute), nay (flute) and tabla (drum) for us again: on Sunday 27 January 2013 at 7 pm at the Nile View coffeeshop and restaurant (situated in Ramla, two houses behind the small street leading to Gezira Garden Hotel), entrance fee: 10 LE. Here some live recordings of yesteryear. 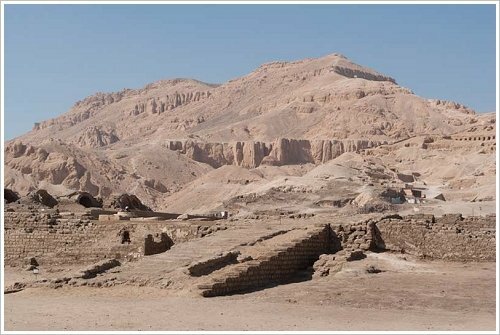 The completely destroyed Mortuary Temple of Amenhotep II (not to be confused with the Mortuary Temple of Amenhotep III) is located at Luxor's western bank north of the Ramesseum. 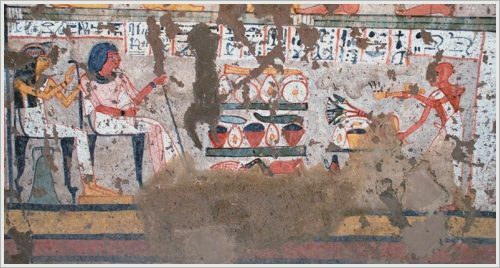 Yesterday, the Egyptian Ministry of Antiquities announced that the Italian mission of Centro di Egittologia Francesco Ballerini (CEFB), which is carrying out excavations at this area, unearthed tombs dating back to the Third Intermediate Period (ca. 1070 - 664 v. Chr.) Each of these stone tombs consists of a shaft leading to a burial chamber with a swooden arcophagus in it decorated with black and red funeral scenes and fragments of a skeleton therein. 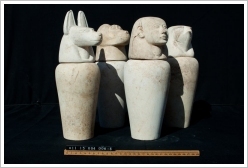 Besides 12 well preserved canopic jars were found, some of limestone, some of burnt clay. Five days ago the archaeologists had found the tomb of a child six months of age with a small terracotta sarcophagus and funerary goods dating back to the Middle Kingdom, 1800 BC. 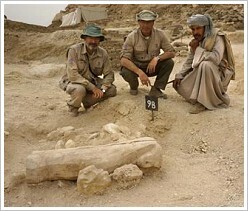 Last year they had discovered tombs of two women. 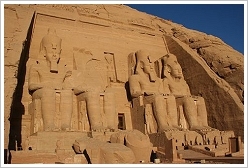 Amenhotep II was the 7th Pharaoh of the 18th Dynasty and reigned from ca. 1426 to 1400 BC. He is kown for his campaigns and his athletic skills. In his tomb (KV35) at the Valley of the Kings a mummy cache with 20 royal mummies was discovered in 1898. 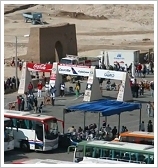 On 18th of January, 2013 the 20th Egyptian Marathon will take place in Luxor. In celebration of the jubilee this year it isn't possible to participate just in the run. It was only bookable in combination with a 5-day stay at a hotel including visits and a breakfast run on 17th of January. For the marathon itsself business as usual: The race will start at 7:00 a.m. with 1,874 participants from 36 countries (according to the official website) over 4 distances: Marathon (42,195 km), Luxor Run (22,289 km), Ramses Run & Walk (12,336 km) or Kid's Run (5 km). The race will end at 1:00 p.m. and prices will be awarded at 7 p.m.
Meeting point is beneath Hatshepsut Temple on the West Bank of Luxor. The street there leeds to the actual circular course at the length of almost 10 km (for marathon one run it 4 times). Also for inline skaters and wheelchair users. While the most holiday dates of the Gregorian and Coptic calendars don't change the dates of the Islamic calendar are movable (marked with *).